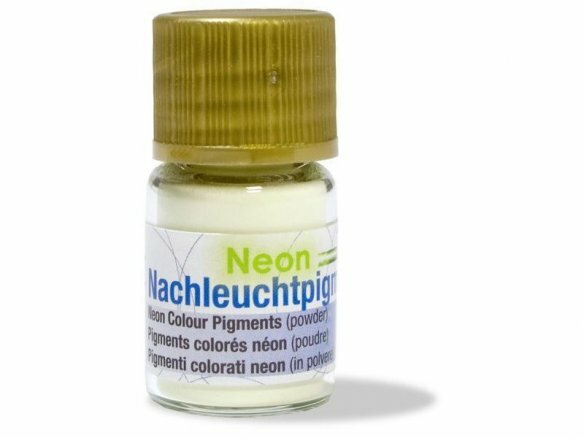 On many wristwatch clock dials or signs for emergency exits you will find colour pigments with a characteristic yellow-green colour that indeed glow in the dark. The phosphorescent part “charges” itself when exposed to artificial light or sunlight and then radiates the light back out into the darkness. Modulor offers self-adhesive FLUORESCENT FILM and other materials that remain visible in the dark but these pigments have the advantage that you can stir them into practically anything, which is to say you can “contaminate” practically any liquid (except: substances containing acids). So it is that this pigment can be used with solvent-based paints or even casting resin in order to make frightful monsters or, yes, practical objects in, for example, a silicone mould. In doing so, however, you should take into account that transparent resins like POLYESTER GTS will become opaque upon curing or, to put it another way, they will lose their transparency – in exchange, however, they will indeed glow in the dark! We have done some testing by stirring the pigment into BOOKBINDING GLUE and were completely delighted by the glow-in-the-dark binding of the booklet! We also found that the pigment was particularly high yielding – you don’t need a lot to get the effect.